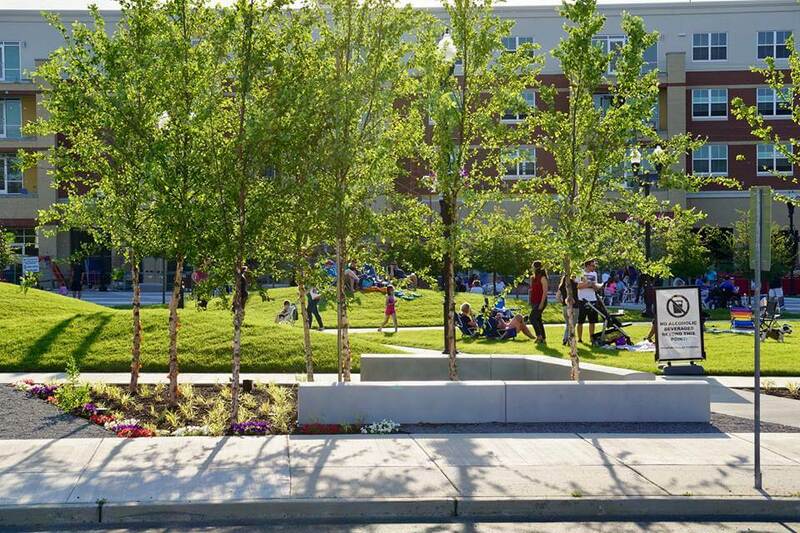 The newly constructed Town Square, where Rowan Boulevard meets Downtown Glassboro, is the active, community gathering place for the entire region. Formerly a series of underutilized buildings the site has evolved into a beautifully programmed 1.75- acre park space. “If you came here 5 years ago at 5 o’clock this place was completely quiet. There was nothing going on. Now there is life, economic activities, people are listening to music and kids are playing. That is what it is all about.”, Dr. Ali Houshmand, President Rowan University This hub is now animated and surrounded by patios and retail uses that spill into the public space as well as daily, weekly, seasonal and annual events, festivals and rituals, creating a vibrant and exciting energy. The Arts Garden exhibitions make modern art available to borough residents, students and visitors. The crowning jewel is the Veterans Memorial Plaza, our proud tribute to America’s Veterans. There is a perfect spot for just about anything at the Town Square. According to Mayor Leo McCabe “We wanted something where people could meet and greet and we felt something that would provide a better quality of life for the residents of Glassboro and the surrounding areas.” “We wanted to bring the students of Rowan Closer to Glassboro. With the pending completion of Rowan Boulevard and the adjacent park, I truly believe Glassboro is the quintessential college town.” The Glassboro Town Square has become a model of success which other municipalities in NJ can follow. It demonstrates how a focused array of public use spaces can be woven together into a cohesive place that inspires connection, expression and joy within a sustainable and enduring public park. Many events activities occur in the Town Square. Check out this video about Summer Fest which took place every Thursday in June and July in the Summer of 2017.